(Bloomberg) -- A rough start to the year for more than $850 billion exchange-traded funds with quantitative strategies is fueling a product rethink. 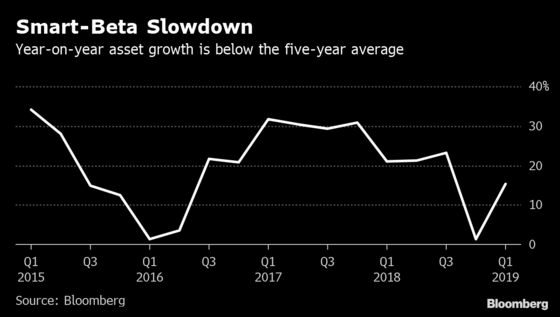 Smart-beta stock ETFs -- which use characteristics such as a company’s value, size or momentum to direct investments -- lured the least money in 12 months in the U.S., dragging asset growth below the five-year average for a second quarter, according to data compiled by Bloomberg. Instead of quitting, ETF providers are doubling down and trying to woo investors with all-in-one funds that pull together several factors. Money managers have come to rely on smart-beta funds. As differentiated products, they can justify higher fees, offsetting lower revenue from broad-indexed funds -- which are now virtually free. So factor investing is getting a reboot: Rather than teach investors how to pivot between products, issuers are creating multi-factor funds that offer exposure to several return-enhancing characteristics. And that seems to be working. Multi-factor ETFs emerged as a bright spot amid the smart-beta slowdown last quarter. These funds added $5.7 billion, half of the overall intake of equity factor funds, with inflows in March exceeding all but one rival -- low volatility, data compiled by Bloomberg show. No wonder then that BlackRock Inc., Pacific Investment Management Co. and OppenheimerFunds Inc. have all started funds targeting more than one equity characteristic. Many of these funds dynamically rotate between different types of stocks in response to market conditions, countering a concern that buy-and-hold factor investors could suffer long periods of underperformance. BlackRock started a rotating strategy last month, and WisdomTree Investments Inc. gave its Japan- and Europe-focused funds active managers. Meanwhile, Principal’s funds are being used to make a Nasdaq Dorsey Wright model portfolio that rotates between factors, the financial adviser said in March. But with the flood of new entrants, the devil’s in the detail. Investors often underestimate the scale of possible losses from multi-factor funds and diversification benefits tend to be overstated, Research Affiliates warned in a paper last year. Complexity is a key reason why adoption by financial advisers has lagged, Cerulli Associates, a Boston-based research and consulting firm, wrote in a report in March. While a rotating Oppenheimer product adjusts its holdings monthly, for example, a dynamic fund run by Pimco tweaks its fund holdings once a quarter. Oppenheimer’s fund has returned 15 percent over the last year, double Pimco’s product, even though their management fees are the same. Multi-factor funds do however satisfy asset managers’ hunger for fees, charging an average $4.70 for every $1,000 invested, exceeding the 20 cents charged by the cheapest U.S. ETF and smart-beta ETFs overall. The spate of new funds is likely to continue as a result.